Wireless Charging:Just place the device with Qi-Enabled or device equipped with a Qi-compatible cover in the charging area, then you are free to enjoy your wireless and limitless charging experience.Please Note: It's normal for the pad and phone get warm slightly during inductive charging, and they may get even warmer, if you use your phone during charging,and Protective Case is suggested to be removed during charging. Charging: Up to 5V-2A input and 5V-1A output,equipped with power-efficient idle mode that never overcharges your battery or wastes energy. Strongly suggest not to pair this charger with off-brand adapters, as those adapters provide unstable power source will interfere charge efficiency or even cause safty issues. 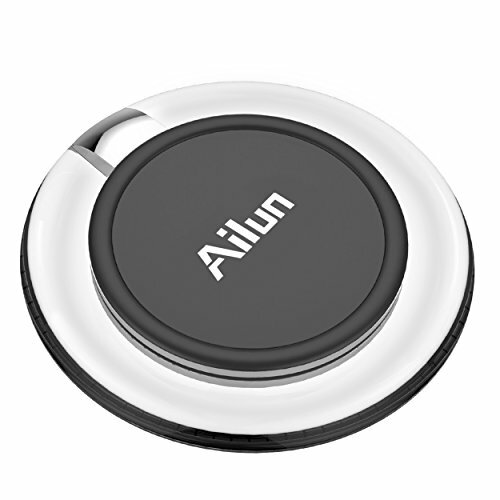 Slip-Proof&Compact Charging Pad: Anti-Slip rubber pad keeps your device from slipping around during charging, compact design makes it light-weight and protable. LED Indicator Lights: Red Light means it's ready to charge, the blue light of the LED indicator will flash slowly when you charge successfully. The Wireless Charger is equipped with advanced intelligent controller, which allows an etremely long and safe standby time. [12-Month Warranty] Universal Applicability: simple design and compatible with all cell phones and other devices with Qi standard. Compatible with Samsung Galaxy S7/S7 Edge,S6/S6 Edge/S6 Edge+/S6 Active,Note 5,Google Nexus 7 2nd Gen/7(2013),Nexus 6/5/4,Nokia Lumia 1520/1020/930/928/920,HTC 8X (US version),HTC Droid DNA, HTC Rzound,HTC Incredible 4G LTE,Moto Droid Turbo,Motorola Moto 360 Smart Watch,Moto Droid Maxx,Droid Mini,SONY Xperia Z2/Z4v/Z3V,and Other Qi-Enabled Phones and Tablets.